H-e-e-e-e-e-r-r-r-r-s-s-Sylvia! Armed with the good stuff. Pirouetting with John Soane, Peter Eisenman, and even Charles Moore. Connecting the dots with intellect, passion, and forensic precision, and trotting out never-before-seen docs blown up to the size of garage doors. Demonstrating not simply with words—which were choice, USDA prime—but with a full-blown demonstration of why what those words were about should matter. And what were they about? Some soon to be forgotten parametric wonder? Some arcane theoretical contest? Or a newly discovered manifesto that intends to change the course of everything? Not at all. They are a reality check, a course correction—maybe, even a scold (though that was never her tone)—that brought many in the room to a thudding encounter with reality. With those words—and the images that accompanied them—Lavin plays Lazarus to a fault, raising tired old post-modern architecture from the dead, breathing new life into what might have been warmed-over pizza and breathing new life into the age-old contest between meaning and symbolism. 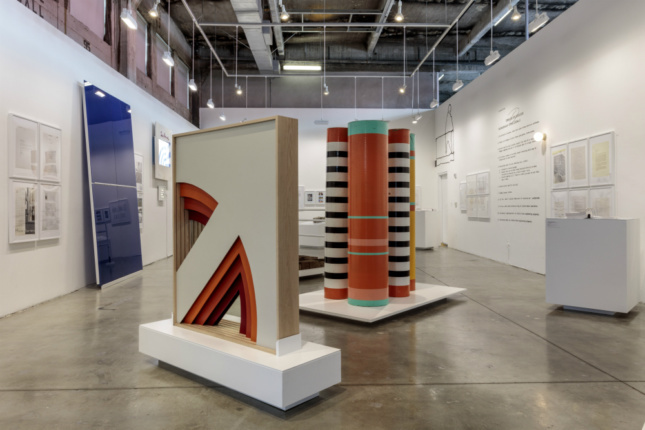 View of Deborah Sussman’s wayfinding signage for the 1984 Los Angeles Olympic Games. 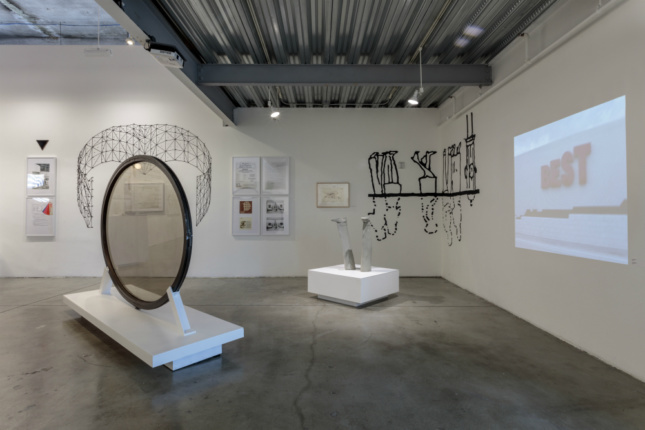 In the exhibition and lecture “The Duck and the Document: True Stories of Postmodern Procedures” at Southern California Institute of Architecture’s (SCI-Arc) Keck auditorium, Sylvia Lavin unearths implicit links between architecture as diverse as James Wines’s and Robert Venturi’s work for Best products, Eisenman’s handrail phobia, and Moore’s yearning to be “free”—to weave a tale of architecture’s gradual loss of autonomy as mechanization takes command*. Increasing regulation, nearly insurmountable hurdles in the supply chain of—for instance, colorants—drove architects to adopt a myriad of ruses and “workarounds” to achieve the effects they envisioned then, and one must admit, apply even more in today’s supplier-dependent world. Lavin’s message to students and aspiring architects is plain. 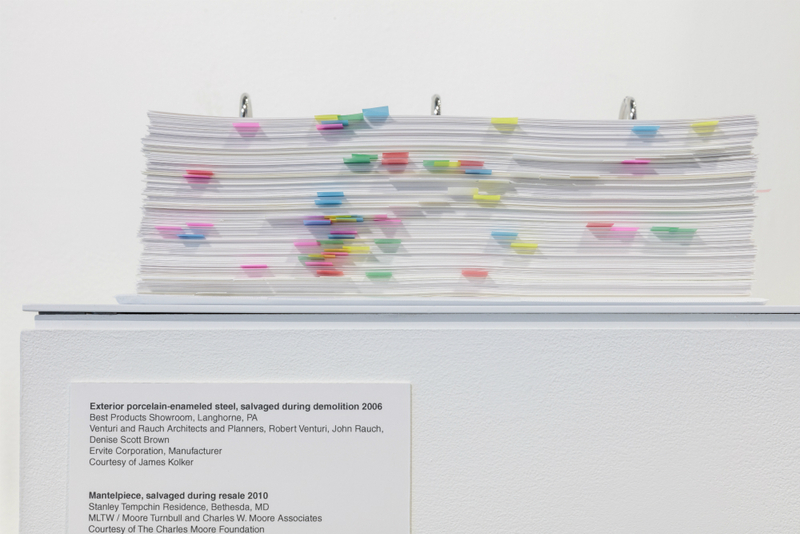 By displaying well-chosen documents and correspondence which underscore the increasing frustration of the post-modern era’s most celebrated architects, she has been able to reveal the minutia behind their efforts, the tests of authorship, and the ultimate outcomes of conceptual and intellectual battles those architects (mostly) lost. With some surprise we learn that MLTW—Moore’s firm with Bill Turnbull, Richard Whitaker, and Donlyn Lyndon (symmetry: His father was a well-known architect)—is “long overdue” on an invoice for $24.53 from Knoll. In another example, we discover an invoice for a single half hour of Moore’s time, billed at $15.00. Pantone paint chips appended to a specification from Venturi’s office attest to his resignation in a battle over color with porcelain panel manufacturer Ervite and the scrutiny of focus groups is revealed in voluminous correspondence about the Sea Ranch project, MLTW’s celebrated Northern California retreat. 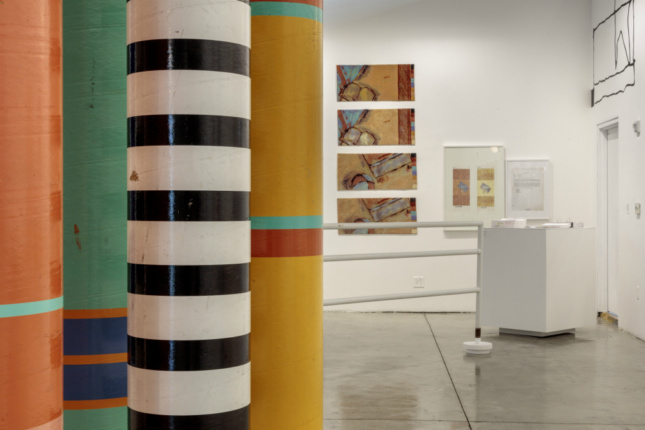 In the gallery one is treated to an array of trophies from that era – a twisted handrail from Eisenman’s House I, in which the curator describes the architect wrestling with code requirements which conflicted with his aesthetic vision—a pair of porcelain-enameled Warholesque panels from Venturi’s florid Best products showroom and a quartet of columns from the Deborah Sussman- and Jon Jerde-designed Los Angeles 1984 Olympics signage—all poignant reminders of a time when the decorated shed reigned supreme. One might ask “what is the purpose of such a show at this time”? Is it to be a counterweight to the pervasive grip of digital design? A plea to restore the autonomy of architecture? Or a simple reminder that as bad as it gets, it’s nothing like the travails endured by our predecessors? My guess is that it is all of the above and more. A provocative and thoughtful peek behind the masks of those masters tells us a lot about ourselves and, at the very least, helps us navigate today’s even rougher waters of regulations, stakeholders, and committees. *Yes, that is Gideon’s phrase. Craig Hodgetts is founding principal and creative director at Los Angeles-based architecture firm Hodgetts + Fung. 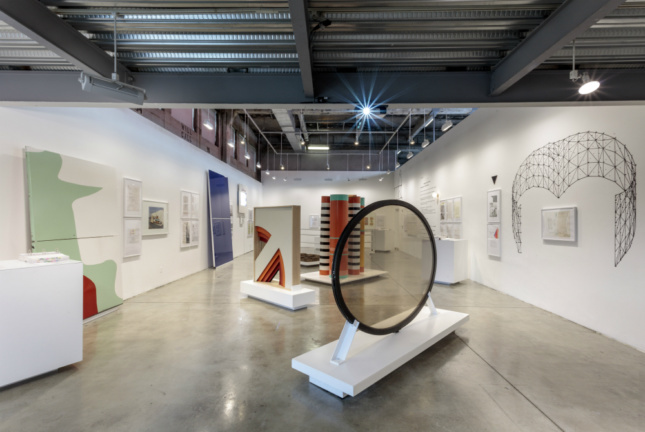 The Duck and the Document, curated by Sylvia Lavin, with associate curator Sarah Hearne and exhibition design by Besler & Sons, is on view at the Southern California Institute of Architecture gallery through May 28, 2017. See the SCI-Arc website for more information.